Their crowns are cut from a vintage Reader's Digest yellowed book page. I made the Halloween banner on Word, and then dripped a tea bag on it. There were black taper candles in white candlesticks in the vignette too, but I don't think they added much. I saw the fake white pumpkins at Hobby Lobby. I wanted one for a project but they wanted $22 with 40%. Then I would have had to carve it....so I bought something else. 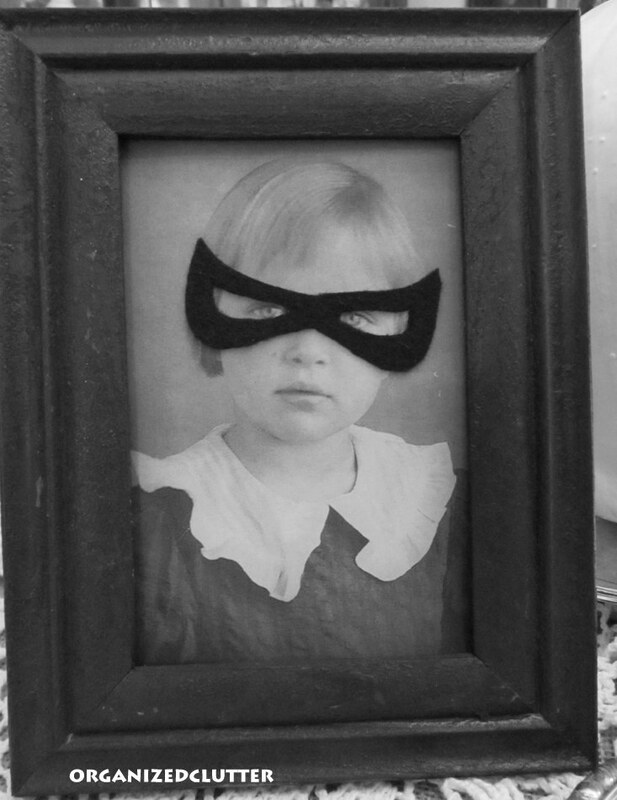 The masks on the B&W family photos are a scream. In the best way. Wow! 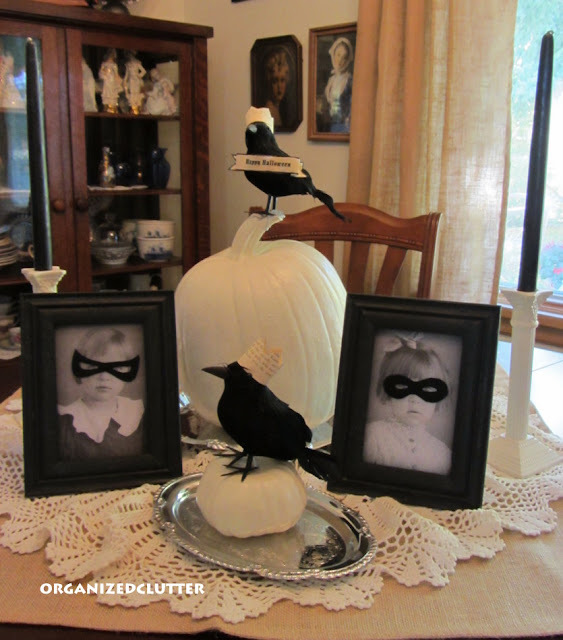 Charlene...this post is loaded with cute ideas! I LOVE everything ... from the crowns on the crows to the masks on your old photographs. Great Job!!! Love the black and white pictures of you kiddos! The little masks are so clever! You really are rocking! It's an adorable vignette! Very cute Halloween decor. Love the masks and the royal crows with their crowns! Oh my gosh Carlene, this is to DIE for girl! The masks are a hoot. 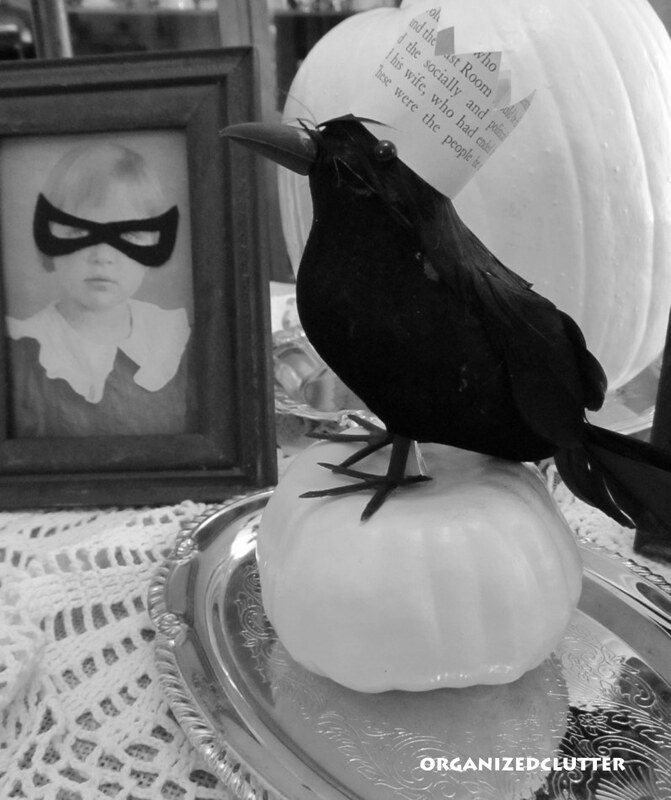 You know I love crows and the crowns are so much fun. 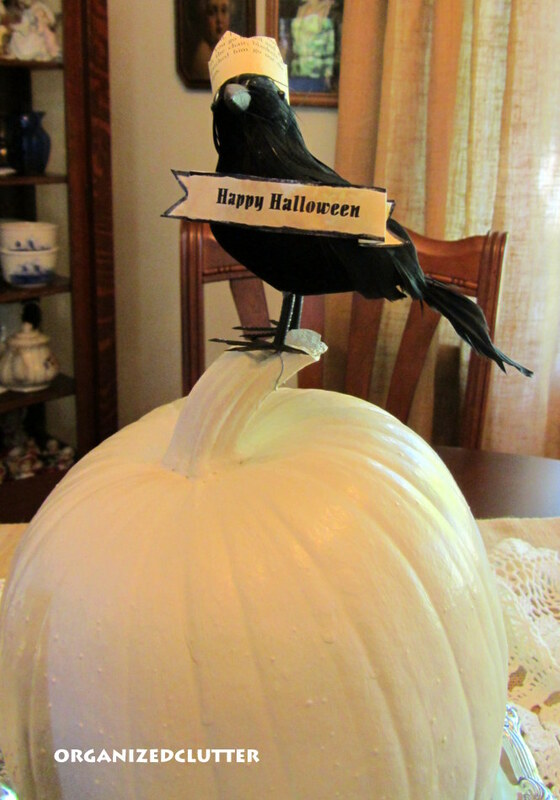 Think I might have to add crowns for Halloween to my crow mantel. The white pumpkins are great too. Seeing this makes me want to pull out my Halloween. NO, NO, I will wait till Oct. 1st. Carlene, you are awesome! 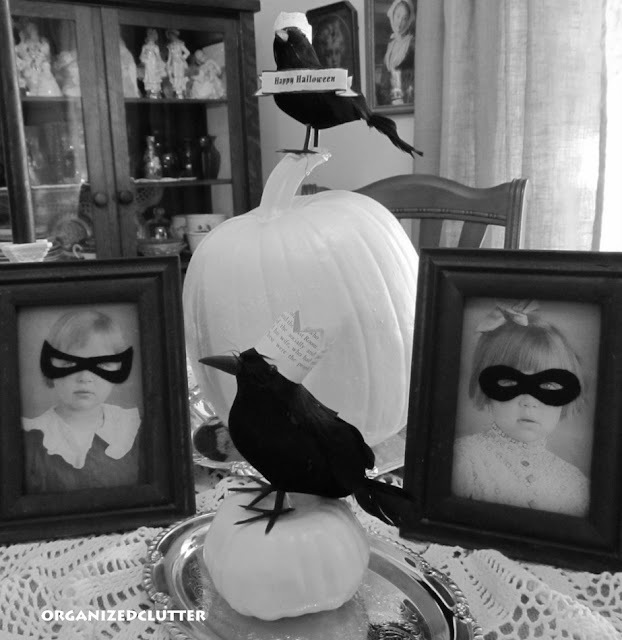 Love the little crowns on the crows and those masks are great! I LOVE this! So cute with the little masks on the girls' photos. 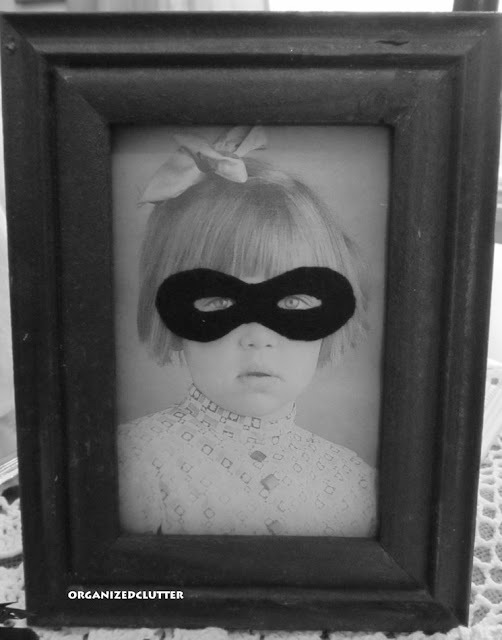 This is such a cute idea....I want to put masks on our family portraits. And I love the crows! 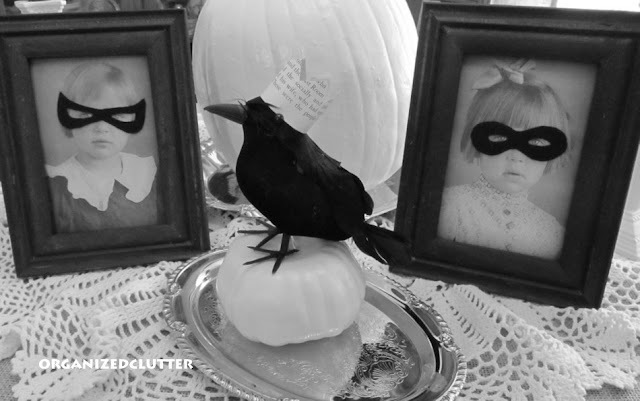 I love everything about your vignettes. BEST SPOOKY POST EVER! I just love the masks, and I would have never thought to paint a pumpkin, You're a genius! I want to imitate your masks. My daughter will either die laughing or call her sister so they can talk about how I'm going off the deep end. It's a toss up! just hopping in to let you know that I'll featuring you on Share Your Cup.